Although many sites on the web are in one language, a growing number of companies are localizing their sites to cater to the needs of the international marketplace. Localizing entails translating the website into new languages and, in many cases, implementing a global content distribution scheme designed to speed up international site load times. If the web is a global medium, why would you need a global content distribution service? If you’ve ever tried loading a website from across the world, you’ve probably noticed that the performance can be pretty bad. A site hosted on a faraway server may be lean in terms of file size, but its sheer distance from you makes it load slowly. If you look at it from the European perspective of accessing sites hosted in the United States, you realize that a lot of European customers are experiencing far slower service. Asian customers in China have it worse. All inbound sites are filtered through “the great firewall of China” to ensure only culturally appropriate content gets through. Along with a content distribution network (CDN) — which creates copies of your site’s pages and content on servers all over the world to speed up local performance — you may also need to offer the site in multiple languages and have content segmented by region or country. Up to 50 percent of a web company’s business can come from overseas. The problem, however, is that this 50 percent is distributed across several languages. The best practice is to use a detection code to direct users automatically to the appropriate country’s website. Putting a handy navigation tool on the website that would allow users to switch to a different country or region that the business supports, however, is the next best thing. It’s important to mark this switching tool clearly with a globe or flag icon so that if users don’t read the language — or language characters — of the site they’re directed to, they can visually recognize how to change sites. 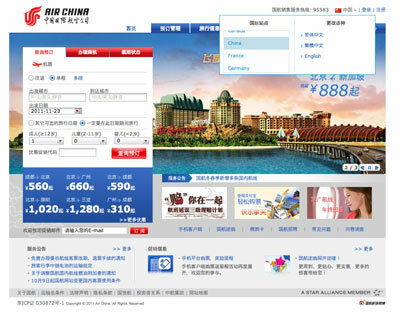 Notice that if you were traveling in China, and checked the Air China website, the default language would be Chinese. Without the little red flag in the main navigation as seen in the following figure, you would not know where to click to change the language to English. Lastly, rather than offering every language for every region, you should tie your language offering to the country or region selected. 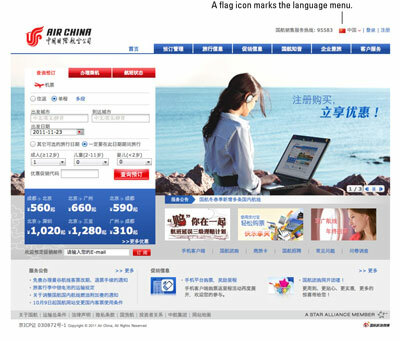 As seen in the next figure, there are just three languages associated with the Air China site. The common practice is for companies to offer their “home” language (for example, American companies would offer English) as well as the official languages for that region or country.